ON JULY 30, 2011, The FIVE-TIME RECIPIENT OF RESTAURANT MAGAZINE’S “WORLD’S BEST RESTAURANT” AWARD HAS COMPLETED ITS JOURNEY AS WE KNOW IT, AND IS CLOSING ITS DOORS, NOT FOR THE USUAL SEASONAL SIX-MONTH STINT TO PREPARE NEW IDEAS FOR THE NEXT YEAR, BUT FOR GOOD. CATALAN CHEF, FERRAN ADRIA, WILL TRANSFORM “EL BULLI” INTO A THINK-TANK FOR CREATIVE CULTURE AND GASTRONOMY, AND IT WILL REOPEN IN 2014. It is heartbreaking to see a 47 year old phenomenon close, however, when one door closes another one opens, and the film El Bulli: Cooking In Progress, by filmmaker Gereon Wetzel, transports us into what Ferran describes as “the complex, yet simple” restaurant and its concrete, yet unpredictable creative process required to become and remain the best. 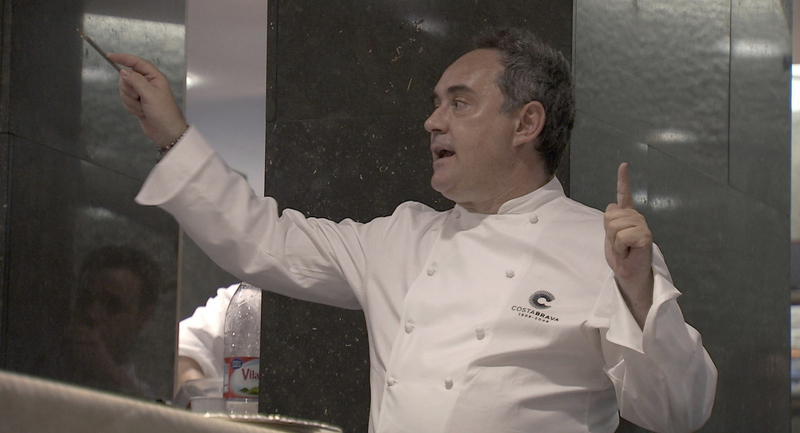 Beginning this July 27th at the Film Forum in New York City, “El Bulli: Cooking In Progress” will teach you what these world renowned experts have spent decades honing their craft on. Think about it this way: 2,000,000 people requested reservations at El Bulli annually, however, only 50 were accommodated on 160 nights per season. Diners did not choose from a menu, instead, each guest was served between 28 and 35 small portions, consisting of cocktails, snacks, tapas, desserts and morphs. Snacks are an interesting alternative to bread and butter, they are little bites (for example, madeleines with black olives) served at the beginning of the meal, after the cocktail and before the tapas. Pre-desserts are small dishes served after the tapas and before the desserts, which mark the transition between the savory and the sweet world, and morphs are an El Bulli invention, which replace petit fours at the conclusion of the menu. A culinary education in itself, you would be at a great disadvantage not to find 108 minutes out of your busy schedule to watch the documentary over the next couple of weeks. El Bulli, also spelled elBulli, opened in 1964 as a simple beach eatery in Cala Monjoi, a cove near the town of Roses, in the Catalan province of Girona, Spain, located a few hours from Barcelona, by a German couple Hans and Marketta Schilling, and was named after the French bulldogs they owned. It later evolved into a gourmet restaurant, serving mainly French cuisine. A turning point began in 1981, when Juli Soler signed on as manager and, in 1984, hired the young Ferran Adria, and his then 15 year old brother, Albert Adria in 1985. Ferran, a believer that “creativity means not copying”, began to find his own individual style, and due to a lack of business in the winter months, the restaurant closed for six months at a time allowing for Ferran, Albert and Oriol Castro, to research new “techno-conceptual” cooking art techniques, while experimenting with culinary physics and food science which soon influenced culinary professionals worldwide. Techniques and textures including foams, warm jellies, salty ices, caramelization, sodium alginate, liquid nitrogen, xanthan, gelification, emulsification, and spherification, put El Bulli on the map, allowing it to earn its third Michelin star in 1997 and catapulting the restaurant forward to becoming a five-time recipient of Restaurant Magazine’s “World’s Best Restaurant” award. Although El Bulli is closing in a few days, Ferran Adria and Jose Andres can be found at Harvard University as they began teaching a 13 week culinary physics course this past fall. Coincidentally, while on vacation in Asheville, NC, I met one of Jose Andres’ (The Bazaar in Beverly Hills) and Ferran Adria’s apprentices, Katie Button. Katie is not only young, intelligent and gorgeous, but hard working, focused, and driven, as well. Out of 8,000 applicants, she was accepted as one of the 40 to intern at El Bulli. Author, Lisa Abend, documented Katie’s experiences at the restaurant in her new book, “The Sorcerer’s Apprentice”, and Katie can also be seen in the film, “El Bulli: Cooking in Progress”, as well. Taking a leap of faith, she had given up a fellowship to study biomedical engineering to pursue her culinary dream, experience the world, work with the best mentors, and this past March, opened CURATE, a Spanish tapas restaurant, with her mother and fiancee, Felix. 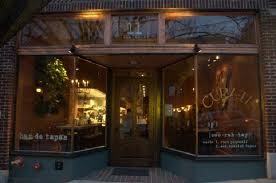 CURATE on BILTMORE AVENUE in the lovely town of, ASHEVILLE, NC has received rave reviews. Q: SHARON ABELLA: What qualities does one need in order to be respected at “El Bulli”? Q: SHARON ABELLA: What was the most valuable experience you learned? Q: SHARON ABELLA: Talk about the various food chemistries, culinary physics and molecular gastronomy. How does one know what to blend together? Is it learned, instinctual or both? Q: SHARON ABELLA: Have you experienced any obstacles being a female in a primarily male dominated industry? Q: SHARON ABELLA: How did you handle constructive criticism from Ferran Adria? Q: SHARON ABELLA: Describe some of the techniques used in the film. Q: SHARON ABELLA: How did Curate come about? Why Asheville, NC? Q: SHARON ABELLA: What’s next for you? You are currently viewing the archives for July, 2011 at One World Cinema.